Oh, my! Time is flying! I can’t believe Christmas is 14 days away and I have just 10 days left in the classroom. It will be a whirlwind the next few weeks with concerts, basketball games and trying to squeeze in Christmas shopping. I’m sure reading will be limited as I seem to have all kinds of grading to do right now, but I’m at least done reading books with my classes, so maybe that will mean I can read a bit at home! I was able to read over Thanksgiving which was wonderful and I’ll share about those books in my Quick Lit post in a couple weeks. I just don’t have time to do full reviews right now. 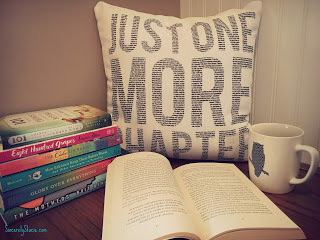 I have a HUGE stack of books to share this month and I can’t wait to get to them all! 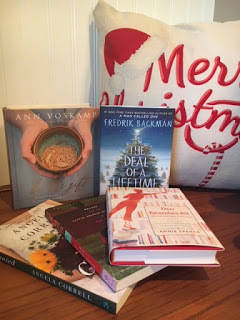 There are plenty of great book ideas for gifts in this post as well. I try to always give a few books as gifts each year and this year is no different. Books always make the best gifts! If you would like to purchase any of the books in this post, clicking the photo or title of the book will take you directly to Amazon. If you choose to purchase the book I may receive a small commission without you having to pay a cent more for your purchase. Thanks for supporting me. I read this with my Freshman Honors class to compare with OEDIPUS REX. Not a happy story and one I had never read before. I’ve read THE CRUCIBLE by Arthur Miller and this one was just as tragic, just in a different way. Willy Loman has been a salesman for 34 years. At 60, he is cast aside, his usefulness exhausted. With no future to dream about he must face the crushing disappointments of his past. He takes one final brave action, but is he heroic at last or a self-deluding fool? This was a Kindle Daily Deal and it’s been on my list for awhile. I think Sheila at The Deliberate Reader wrote about it and piqued my interest, but I could be wrong. I’ve been on the library wait list forever. Now someone else can have my spot! YOU DESERVE AN EXTRAORDINARY LIFE. IT’S TIME TO WAKE UP TO YOUR FULL POTENTIAL! This was a Kindle Daily Deal and I snagged it because I loved A MAN CALLED OVE and this one sounds similar. I borrowed this from our library on audio and really loved it. It is read by each of the twins. You don’t have to be a Republican or even like politics to be enamored with these sisters. Born into a political dynasty, Jenna and Barbara Bush grew up in the public eye. As small children, they watched their grandfather become president; just twelve years later they stood by their father’s side when he took the same oath. They spent their college years being trailed by the Secret Service and chased by the paparazzi, with every teenage mistake making national headlines. But the tabloids didn’t tell the whole story of these two young women forging their own identities under extraordinary circumstances. In this book, they take readers on a revealing, thoughtful, and deeply personal tour behind the scenes of their lives, with never-before-told stories about their family, their adventures, their loves and losses, and the special sisterly bond that fulfills them. I snagged this Kindle Daily Deal since it has been on my must-read list. Elvis Babbitt has a head for the facts: she knows science proves yellow is the happiest color, she knows a healthy male giraffe weighs about 3,000 pounds, and she knows that the naked mole rat is the longest living rodent. She knows she should plan to grieve her mother, who has recently drowned while sleepwalking, for exactly eighteen months. But there are things Elvis doesn’t yet know—like how to keep her sister Lizzie from poisoning herself while sleep-eating or why her father has started wearing her mother’s silk bathrobe around the house. Elvis investigates the strange circumstances of her mother’s death and finds comfort, if not answers, in the people (and animals) of Freedom, Alabama. As hilarious a storyteller as she is heartbreakingly honest, Elvis is a truly original voice in this exploration of grief, family, and the endurance of humor after loss. I don’t remember exactly where I heard about this book…maybe the Kindle Deals? I got it for just $1.99, which I am sure will be worth it! 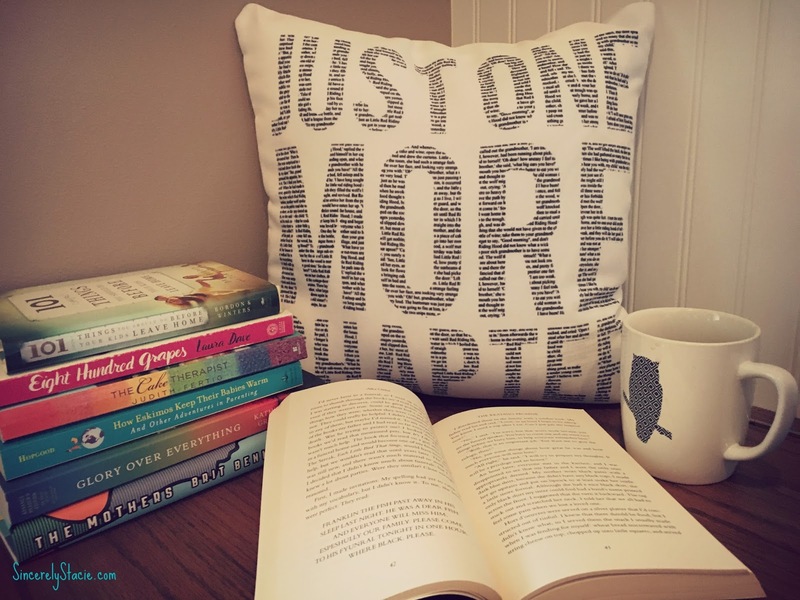 A book about a love of books? Yep, I’m in! “When I have a little money, I buy books. And if any is left, I buy food and clothing.” — –Desiderius Erasmus — Those who share Erasmus’s love of those curious bundles of paper bound together between hard or soft covers know exactly how he felt. These are the people who can spend hours browsing through a bookstore, completely oblivious not only to the passage of time but to everything else around them, the people for whom buying books is a necessity, not a luxury. A Passion for Books is a celebration of that love, a collection of sixty classic and contemporary essays, stories, lists, poems, quotations, and cartoons on the joys of reading, appreciating, and collecting books. This was a gift for myself. I’m hoping to make this my daily devotional of 2018. The idea that even in the depths of our own brokenness God can use each of us to be a gift to someone else is powerful—that He makes each of us enough to give to someone else. Just as powerful is the realization that in becoming God’s gifts to others, our lives become more abundant: “Maybe the only abundant way forward is always to give forward.” Ideas this powerful need to be put into action. Live out the messages in Ann’s bestselling books, The Broken Way and One Thousand Gifts, with Be the Gift, a practical guide that takes you through each day of the year with ways to bless those around you. Featuring selections from The Broken Way and Ann’s blog, beautifully designed quotations, inspirational verses, and Ann’s signature photography, this gorgeous book will be an incredible gift to any loved one. It also includes pages of perforated gift tags in the back to include with a meal dropped off for an ailing friend or a pie baked for a friendly neighbor or even passed to a friend with a much-loved book. Greatness Isn’t Born. It’s Grown. Here’s How. This one was also a Kindle Daily Deal and was highly recommended by Anne Bogel of Modern Mrs. Darcy. A New York Times bestselling author explores cutting-edge brain science to learn where talent comes from, how it grows—and how we can make ourselves smarter. How does a penniless Russian tennis club with one indoor court create more top 20 women players than the entire United States? How did a small town in rural Italy produce the dozens of painters and sculptors who ignited the Italian Renaissance? Why are so many great soccer players from Brazil? Where does talent come from, and how does it grow? New research has revealed that myelin, once considered an inert form of insulation for brain cells, may be the holy grail of acquiring skill. Journalist Daniel Coyle spent years investigating talent hotbeds, interviewing world-class practitioners (top soccer players, violinists, fighter, pilots, artists, and bank robbers) and neuroscientists. In clear, accessible language, he presents a solid strategy for skill acquisition—in athletics, fine arts, languages, science or math—that can be successfully applied through a person’s entire lifespan. I purchased this as a gift, but I’m torn because I want to read it. Maybe they will regift it back to me! We had a book swap at our family Christmas last month and this was one I took off the pile. The description sounds wonderful! In this enchanting tale about the magic of reading and the wonder of romantic awakening, two hapless city boys are exiled to a remote mountain village for reeducation during China’s infamous Cultural Revolution. There they meet the daughter of the local tailor and discover a hidden stash of Western classics in Chinese translation. As they flirt with the seamstress and secretly devour these banned works, they find transit from their grim surroundings to worlds they never imagined. I read the first two books in Correll’s series which were wonderful and was thrilled to get to review her third. See them, HERE and HERE. Former international flight attendant Annie Taylor is embracing her country roots and racing toward a future with her sustainable farmer fiance, but wedding plans are complicated by her new job, a mysterious ex-boyfriend, and a narcissistic father. Meanwhile, Annie’s old-fashioned grandma, Beulah, is facing a shake-up in the last place she ever thought she would–home. A crisis on May Hollow Road follows a friend’s betrayal, challenging Beulah’s forgiving nature. An unwelcome diet, a new houseguest, and a possible overseas trip will all stretch her spirit–if she lets it. I am in love with Bachman’s writing and when I saw this I had to grab it. I love reading a Christmas story during the season and even though this may not be a traditional one, I’m sure I’m going to love it. 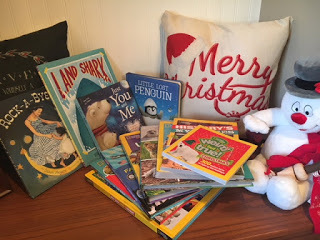 These are always favorite books with kids and I’m anxious to check out all the fun facts about Christmas! You can see my review, HERE. Even Christmas can be weird — it’s true! Get ready to celebrate the holiday season with wacky facts, stats, tidbits, and traditions about the most wonderful time of the year. Did you know that Santa’s reindeer are probably all female? Or that artificial snow can be made from seaweed? Or that “Jingle Bells” was the first Christmas carol sung in space? Every kid will ho ho ho when they unwrap this fun and festive little gift book, perfect for stocking stuffers or under the tree. If you know of a dinosaur fan, this is for them! Dinosaurs continue to fascinate kids, and although these amazing creatures roamed the Earth ages ago, new dinosaur discoveries are still being made today! The new edition of the popular Nat Geo Kids Dinopedia includes all the latest species and is the most complete, up-to-date dinosaur reference available. Find favorites, like the fierce T-rex and the gentle Brontosaurus, plus audacious new finds, like the Anzu, Kosmoceratops, and Yi. Every dino profile is colorfully illustrated and features descriptions of when they roamed the Earth, how they lived, what they ate, and more. There are more than 600 dinos featured in all, including 10 profiles of recently discovered dinosaurs and new entries in the Dino Dictionary. Reports from paleontologists present the latest news and insights from the field. Oh my, I know my great-nephew will love this book! Can’t get enough hilarious jokes from National Geographic Kids? Never fear! With this brand-new bigger, better Just Joking book, you’ll get loads of laughs to keep you ROFL and to share with friends and family. It’s jam-packed with 1,000 jokes, including knock-knocks, puns, riddles, and tongue twisters, plus more than 1,000 photos of cool animals, silly situations, and more! Get hundreds of fun facts about all the coolest creatures and some of the craziest info about the history of funny business. It’s the right formula for laughing, learning, and maybe even launching your stand-up comedy career! Oh my goodness! This book is definitely jumping to the top of my favorites list. Amazing and adorable photography with interesting facts make this a great book to keep out year round! Sweet dreams are made of this! Join National Geographic Kids on a trip around the globe to celebrate nature’s nursery. Get up close to adorable baby animals — from the teensiest turtle hatchling to the biggest baby whales; from black bear cubs frolicking free in the Rocky Mountains to a kangaroo joey lounging safely in its mother’s pouch. Readers will ooh and aah over the cute baby pictures, sweet stories, folktales, and poems in this lovely keepsake book. Ideal for reading to sleepy little ones! This book looks fascinating. I’m sure I will learn plenty from it! Travel back to ancient times to revisit classic Bible stories from the Old and New Testaments. Learn fascinating facts about biblical history, then explore that same landscape as archaeologists are studying it today. Unearth clues about where these stories took place and how people in that time period might have lived. Stories include the Garden of Eden, Joseph in Egypt, Moses and the Ten Commandments, the birth of Jesus, Paul’s conversion, and many more. Classic paintings and photos of the Middle East today enrich the archaeological explanations. Kids don’t just revisit classic Bible stories in this book … they’ll dig deeper into the history behind the tales to learn more about the biblical world. Wow! This book looks like so much fun! Amazing National Geographic photography and really great facts! I’m gifting this one this Christmas! Did you know that the first stop signs were black and white? Or that a litter of kittens is called a kindle? There’s a lot to know and we bet you’ll have fun learning these fun, far-out facts in the next super series from National Geographic Kids! Based on a favorite department in Nat Geo Kids magazine, this book is chock-full of fascinating facts, silly stats, and catchy little knowledge nuggets in all kinds of cool categories, from astronomy and dinosaurs to revolutions and breakfast. Special features include Extreme Weirdness, Strange Places, Wacky World, and more. From flying saucers to the Yeti, this book has all the mysterious stories we have heard over the years. We love anything about Presidents, First Ladies, or the White House so I know all of us will love the facts shared here. Welcome to the White House! Go behind the scenes to get a 360-degree view of America’s most famous president’s residence, from how it was built in 1792 and the fire of 1812, to today’s state dinners, celebrations, celebrity pets, and more. Discover through 1,000 fun-to-read facts what it’s like to live and work at 1600 Pennsylvania Avenue, the quirky rules of the house and how the Secret Service keeps it safe. Find out how the kids who have lived there play, watch movies, and entertain friends. With a treasure trove of material from the White House Historical Association, this book presents a fascinating story of the building and the many people who have shaped its 225-year history. This book came in my Bookroo Subscription. I reviewed this subscription service and the books that came HERE. A mother soothes her daughter before bed as they say good night to all the things in her room—a rocking horse, dolls, blocks, and even the pictures on the wall—until it’s time to share a story and a kiss good night. With lulling rhymes and lush watercolors, Rock-a-Bye Room is a homespun love song from a mother to child with a dreamy, rockabilly twist. This tender lullaby will be the perfect complement to any child’s nighttime ritual. I purchased this as a Christmas gift for my great-niece. The story of a baby penguin exploring its new world is adorable. There’s an egg on the ice and it’s about to crack! When a fluffy, little penguin chick hatches out, he doesn’t know what he will find in the big, wide world. Will there be adventure, or is he in for some scary surprises? Come and see what happens in this touching tale about family and friendship that’s perfect for snuggling up and reading together. I just loved this story of a little bear bored with all the snow. It’s a Christmas gift for one of my great-nieces. Little Bear was bored at his home in the snow. There was nothing to do and nowhere to go! Come and join Little Bear as he is taken on a playful adventure by Big Bear. There is always fun to be found, you just need to know where to look! Discover all the wonderful things Little Bear never noticed before in this charming tale about finding fun and friendship. I’m linking up with THE DELIBERATE READER for her monthly feature NEW ON THE STACK. To see other bloggers new books from November, click HERE. As always, be sure to let me know if you read any of these or purchase them for loved ones on your list. There are so many great books here, I can’t wait to get started on them!